By its chemical structure Danabol 50 is near to 17-alpha-methyltestosterone and due to these Methandienone owns a strong anabolic and androgenic action that is seen in the significant growth of strength and muscle mass. Methandienone acts fast and for sure: the addition of one-two kilograms per week within first six weeks is a norm during the use of Methandienone. The accumulated body weight is gathered from the actual growth of muscular issue (muscle fibers hypertrophy) and, mainly, thanks to an observable liquid retain in the organism. It is quiet different, especially for the athletes, weightlifters and power-lifters. This spectrum varies from 2 to 20 and more tablets of everyday use. Daily dosage, having really good action over the athlete is somewhere between 15 and 49 mg. The dosage should always correspond to the individual abilities of the sportsman. The beginners should never use more than 15-20 mg of steroids per day because even with this dosage they will be able to achieve significant results within first 8-10 weeks. And when the action of the preparation for this group of sportsmen after nearly eight weeks decreases and the athlete would like to continue the “course”, then he should not increase the preparation dosage. In addition to the preparation it is better to use an injection steroid such as Primobol of 200 mg per week or to totally pass to one of the stated above preparations. The use of Testosterone is not recommended at this stage. For totally impatient sportsmen of average level the combination of 20-30 mg of Methandienone per week and 200-400 mg of Nandrolone Decanoate will result in a miracle. Professionals, the athletes of “advanced” level and those, who have the weight of more than 100 kg, need a dosage that doesn’t exceed 40 mg per day and very rare 50 mg. There is no any sense in increasing the amount of tablets of Methandienone till the incomparable volumes because 15 tablets don’t act better than 7 or 8. The everyday dosage of 50 mg comes from the total incompetence. 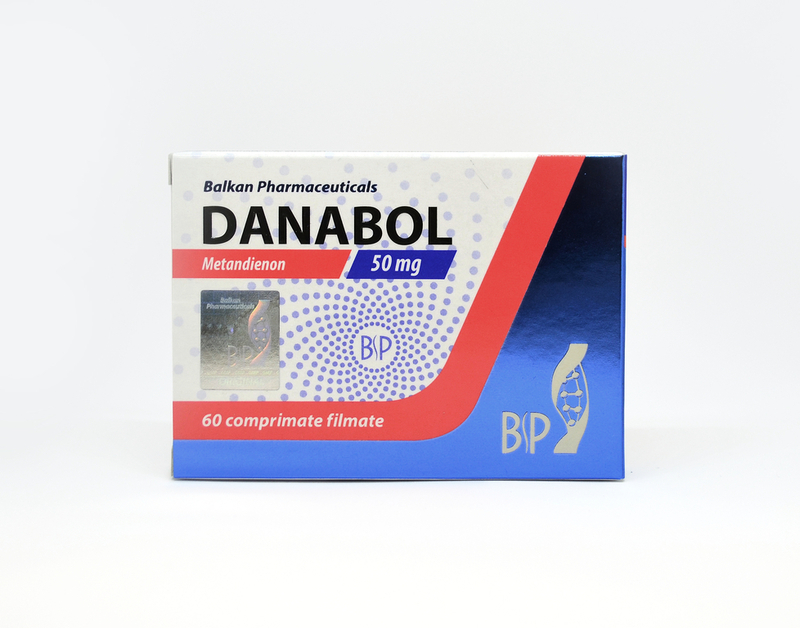 The simultaneous usage of Danabol and Anapolon 50 on the other hand is even worse idea because these two preparations are very similar by their action, and due to this there develops the situation similar to the one when the athlete uses 10 and more tablets of Danabol. Methandienone is of little use for the preparation to the competitions because it causes strong water retain at many athletes and also thanks to its convertibility to estrogens makes it difficult for the athlete to get rid off the fat. Those who don’t have such a problem and also those who used to use Tamoximed and Provimed, may use Methandienone while “drying” together with the “competitive” steroids - Parabolan, Strombaject, Nandrolone D, Oxandrolon and others. With 10-20 mg per day dosage of Methandienone (Danabol) achieve reasonable results. Female athletes that are sensitive to additional amount of androgens and those who totally are not afraid of side effects of mascunalization, use 2-4 tablets per day during maximum of 4-6 weeks. Bigger dosages and longer periods of preparation use bring big results but make the androgens presence visible in the female organism. The women who appreciate their femininity shouldn’t use more than 10-20 mg of Methandienone per day and 50-100 mg of Nandrolone D 20% per week for more than 4-6 weeks. This is the side effects of Danabol. Methandienone (Danabol) acts for only 3,5-4,5 hours. It should be used at least two times per day in order to reach enough concentration of chemical substance in the blood. The scientific investigations show that the Methandienone action during the trainings compared with the action during the rest from the trainings is even shorter and that’s why it would be the best choice to use the preparation three times per day because Danabol has methyl radical in 17-alpha position, it should be used under tongue and this will minimize the risk of the possible problems with the liver. At the third day after the usage termination of Danabol the presence of its active chemical substance of Methandienone in the blood by the results of the analysis is negative. This means that the tablets action has passed. However, the competing athlete and the athlete for doping-test should rely only on negative urine probe because the liberation of decomposition products with Methandienone with urine lasts longer. The maximum concentration of acting chemical substance of Methandienone in blood is achieved within one-three hours after its use. Just simple use of only 10 mg results in 5 times increase of the average amount of testosterone at males. The essential reason that Methandienone has good action over every athlete is that the endogen production of cortysole is reduced by 50-70%, and consequently the decomposition of protein in the muscle cell is decreased significantly. Although Methandienone (Danabol) has many potential side effects, they are rare at the dosage of 20 mg per day. The main reason during the use of Methandienone is load over the liver; at high dosages and long use the preparation acts toxically on it. However, even at the dosage of 10 mg per day the preparation may increase the liver secretion. This normalizes again when the preparation is not used because Methandienone quickly increases the weight by the means of strong water accumulation; tension and heartbeat rate increase are possible, these requires the use of hypertonic(pressure decreasing substance – for example , Clophelin) under the given circumstances. Tamoximed and Provimed use may be also required because Methandienone is aromatized in highly aromatized and converts to estrogens easily, causing gynecomastia at some athletes. Due to strong androgenic component and its conversion to dihydrotestosterone the activity of sebaceous glands is excited which may cause acne increase on face, chest, back and shoulders at some athletes. Considering the hereditary predisposition Danabol may accelerate baldness, the reason for it is again the convertibility of its active substance to dihydrotestosterone. Danabol causes significant action at endogen testosterone level. The investigations showed that 20 mg of Methandienone used for more than 10 days decrease the level of testosterone production in the organism with 30-40%. This is explained with the well performed antigonadotropic action of Methandienone, i.e. it inhibits gonadotrophins secretion. ; FSH (follicle stimulating hormone) and LH (luteinizing hormone) in the pituitary gland. 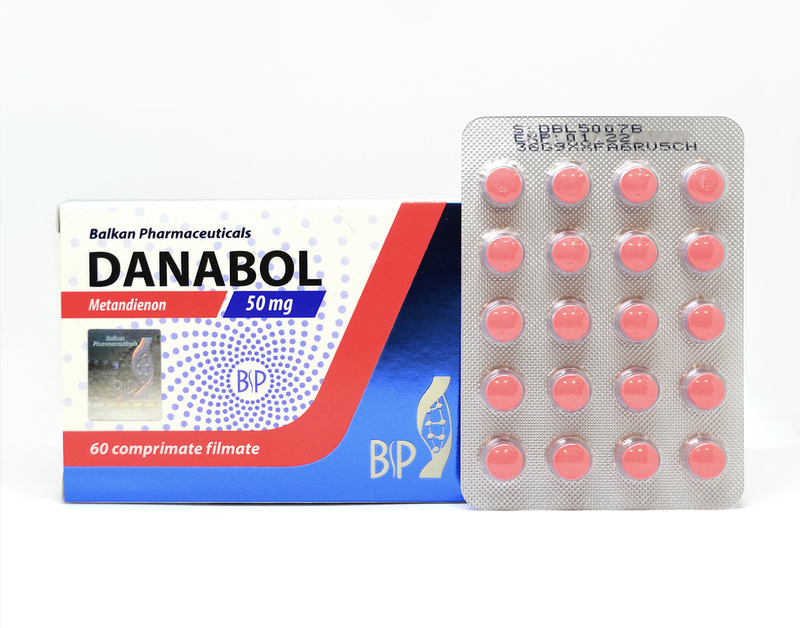 One more disadvantage of Danabol is that as the use of preparation is stopped strength and mass loss is often observed after that, because the water that is retained while the use of the preparation, is again removed from the organism. For big dosages (50 mg per day) in particular cases there may be observed the increasing aggressive behavior of the athlete which directed for the trainings could be an advantage of the preparation. Those who are disposed “explode” easily should pay attention at these feature of Danabol (Methandienone) so that its use wouldn’t lead to uncontrollable actions. Although all possible problems, Danabol (Methandienone) is the anabolic of “good disposition” for the most of athletes, which betters the disposition and increases the appetite at many sportsmen; that contributes to the psychological enlightenment and increasing self-assessment when combined with the achieved results.